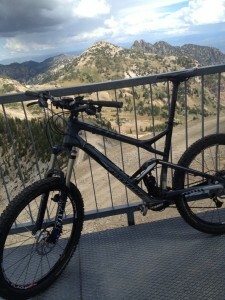 I’ve been hearing for months of a new top-to-bottom mountain bike trail at Snowbird, dubbed “The Big Mountain Trail”. Snowbird is a big and steep mountain and any trail that switchbacks its way down the 3,000 vertical feet accessed by the tram is sure to be a gravity-fueled descent. The lure of Oktoberfest (open June – October, www.snowbird.com) for post-ride beers, brats, schnitzel and alp horns was the ideal motivation to head up Little Cottonwood for a test ride. The tram had only a dozen people on the way up, prompting the operator to urge us in walking around in elbow space rarely available in the winter months. Scoping some of my favorite winter lines such as Cirque, Tower Three and Baldy on the way up had me prematurely excited for winter and skiing. But, we were here to bike! Dropping down the wide road heading east from the 11,000 foot summit, the Big Mountain Trail starts at the top of the Little Cloud high-speed chairlift. Once construction is finished on Hidden Peak however, the trail will drop North instead. The start is indicative of the next almost eight miles: alpine, rugged and rocky, but never too steep and nothing too technical. We passed several intermediate riders on hardtails, though I would recommend a full-suspension steed. Conversely, a few downhill riders in armor and helmets passed us, possibly on their way to Comic Con? Kidding. My point, however, is that all riders can tackle this trail. Once past the first dozen switchbacks, of which I made about 90%, the trail enters treeline, but the grade remains nice and fast. Hidden peak looks almost as far away as the base and Mt. Superior stares us right in the face across the canyon. A few late-season wildflowers remain, lining some sections of trail, and multiple stream crossings provide a couple of fun splashes. We pause for a few “photo ops” with our phones – neither of us wants to admit to the other our forearms need a rest. Whoever thought riding downhill is easy has another thing coming – this is tough work! My forearms are a bit sore from braking and absorbing impact, but my smile is ear to ear the entire way. Nearing the base area, we cross from Peruvian Gulch and into Gad Valley where we opt to hang a left and add on the Baby Thunder trail. Winding through thick aspens and tall pines the trail connects with Dean’s Delight and ultimately the base of the tram, only 50 minutes after we disembarked the tram 3,000 feet above. With adrenaline still high from the screaming downhill sections, coercing each other into a second lift up the mountain for a second ride was quite easy. 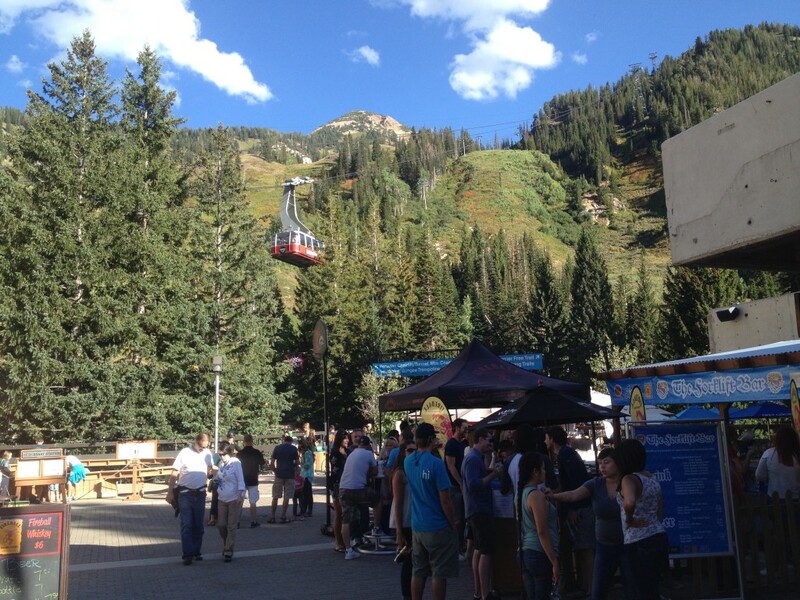 Two top-to-bottom tram laps in winter simply gets me warmed up for a full day of skiing at the ‘bird, but two summer bike runs is all I can handle; it is on to Oktoberfest! The Bavarian themed summer staple is in full swing on the tram plaza and the surrounding lawn and activity center. Due to the infinite wisdom of the morality patrol (read: DABC) Oktoberfest was almost OkSOBERfest this year. Crisis was luckily averted when Snowbird was granted a liquor license and it is business as usual at this venerable end-of-summer event. I hadn’t been up to Oktoberfest in a few years and the chance it may be no more ensured I had it on my summer to-do list. 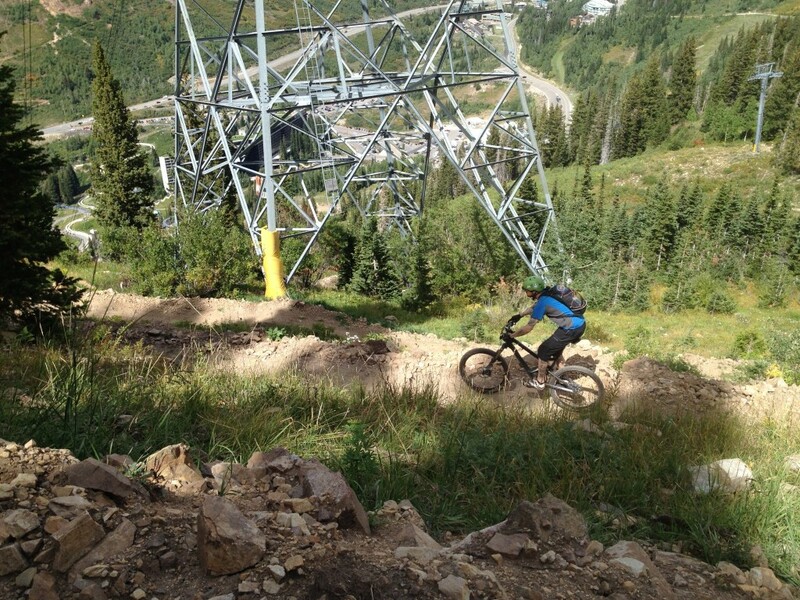 Adding the prospect of the chance to ride the new Big Mountain Trail was more than enough reason to make a day of it. With dozens of beer vendors to choose from we buy tall steins in commemorative mugs with Squatters Full Suspension foaming over the top. Deciding between wings and brats proves to be an unsolvable puzzle, so we order huge plates of each and dive in. With live music in the background and soft light on the mountains above, Snowbird takes on a festive atmosphere hard to beat. With 6,000 vert of descending over 15 miles of biking under our belts, it’s hard not to doze off. Well done Snowbird, well done.